Hearing a lot about the new breed from Tata, the Aria, I was just waiting to get my hands on the same and when finally got a chance, I was in the waves with very new thoughts regarding the company in mind. Exteriors: The car looks extremely sophisticated. 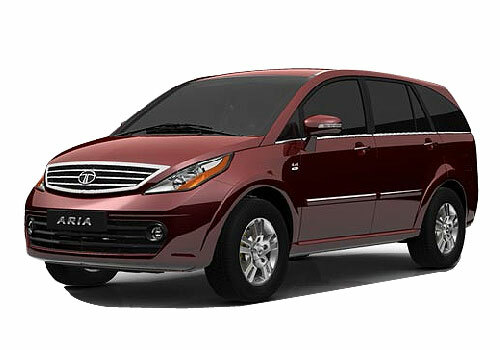 Tata Aria’s front appearance is very aggressive. Just like Tata Innova, it looks like a MUV but its muscular wheel arches makes it look like a SUV. The automatically adjustable outside rear view mirrors also have turn indicators. Its sophisticated headlamps and bonnet creases will remind you of its hatchback siblings. Talking about front, its lower air intake is bigger than other SUVs and it contains front bright fog lamps in round shape. To give Aria uniformity, its wheel arches and bumpers are in body color. Now coming to the side view, Tata Aria has its body colored door handles placed parallel to the rear side mirrors. It has five doors and five-spoke 17 inch alloy wheels with tubeless radial tyres add to its aggressiveness. Other features are high mounted vertically stacked tail lamps, large dual elliptical exhausts, rear wiper auto wipe, while reversing and a third stop lamp placed above the tail gate. Interiors: Tata Aria has the most luxurious and spacious interiors among all Tata Motors products. The steering wheel is tilt adjustable, has four spokes and mounted audio and phone controls. A high-tech multimedia LCD with a GPS navigating system is installed in the middle of the dashboard and it will definitely grab your attention. The roof of Tata Aria is fitted with mini glove boxes in which one can put mobile phones and other stuff. Other features like infotainment system, dual air conditioning with automatic climate control and cruise control, dimming roof lamps add to its interior beauty. The car has three rows of seats of which second and third row seats can be foldable fully flat. The problem arises for the third row leg room space. People sitting in third row find it cramped. The overall interiors of Tata Aria are luxurious. Engine: Tata Aria has inherited its engine from Tata Safari. The engine is very powerful, its capacity is 2.2L and other specifications are 2179cc,4-cylinder, Direct Injection Common Rail with dual mass flywheel. It provides a maximum power of 140 PS at 4,000 rpm. Further, its engine is refined with optimized rubber mounts, aluminum cast sump, better acoustic package with a dual mass flywheel which helps in unwanted vibrations and engine gives its best performance. So in spite being inherited from Tata Safari, it performs a lot better in Tata Aria. Performance: Overall performance of Tata Aria is very good. It has underwent many European crash tests and as far as safety is considered as safest Tata Motors product. Other feature like 6 airbags and seat belts for every seat further ensures your safe ride. Its powerful engine ensures a nice road trip. So Tata Aria is a tough competition to its hatchback due to its looks and performance. Conclusion: The car provides all luxurious features with unmatchable safety techniques. Although rear leg room space is less, its personality covers all of its drawbacks. But due to its high price, it is not recommended unless you are crazy about Tata. Tata Aria's Interior Features and Exterior Features are awesome but it's price is too high.